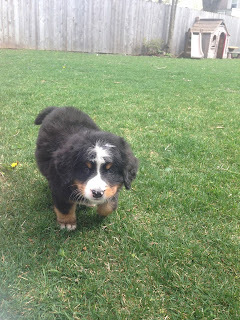 Almost six months to the day we lost Adler, we added our second Bernese Mountain Dog, Sadie, to our family. She's a lucky girl our Sadie but we feel lucky too. 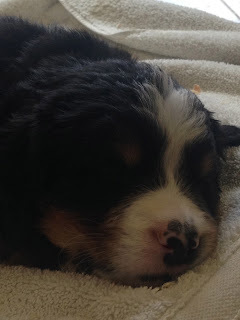 Lucky to have had such a great first Berner girl and lucky to be able to do this again and just six months later (especially with the rising popularity of the breed and breeders fielding 40-50 emails a month from wanna be Berner owners). So off we went on Saturday morning, our whole family, to pick up our sweet Sadie girl. A blessing sent from Adler for sure. We know she had a hand in sending Sadie to us and Adler must've told her she has big "paws" to fill because so far Sadie has been great. Of course she's had a few accidents in the house but that's to be expected but she's gone outside more than inside and she's even ringing the bell that we put on the door less than 48 hours ago. Smart girl. She's also a curious and social girl for sure. She loves to be near us at all times. Cuddling. Laying on our feet or pretending she's a cat weaving in and around our legs as we stand there talking. She nips a lot which Peyton and Hailey don't really appreciate, but hopefully that will wind down some as we train her. Right now she likes to sleep under things like the table, the air conditioner units out back and our deck steps. We're always dragging her out of somewhere. She also sleeps with her head in her water or food dish! Hilarious! And, yes, sometimes she flips them hitting herself in the head. The first night actually went pretty well. She cried for a minute or two then settled into her crate and slept from about 12:30am until about 6:10am. Easier than a newborn baby - that's for sure! She has had a lot of visitors in her 36 hours of being home and tomorrow begins her puppy school training. Off to bed now so she gets her rest but first here are some pictures of her first weekend with us. I will not be this size for very long as I am expected to gain 2-3 lbs per week! 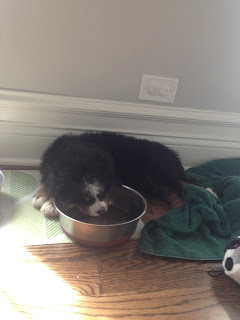 I like sleeping in my dish. It's very comfortable. Kind of like a pillow. Hey, this isn't Adler. Amazingly Hailey has adjusted to calling the puppy Sadie although she still gets a bit confused at times and reverts back to Addie. I learned how to flip my dish all on my own. It's been almost 6 months since we lost Adler. I still think about her and miss her every day. I finally donated her left over dog food just last week but her bed still sits by mine. Her leash still hangs in the garage and her photos now adorn our walls and bookshelves. She is so very missed. Every day. There is no greater way to honor her than to talk about her. We do it often if not daily, with the kids. We say hi to her whenever we see a Bernese Mountain Dog (we think it's her way of saying hi to us), and it's usually followed by an "I love and miss you Adler!" When I had notified our breeder about Adler's passing she put it so well - "No one will ever take Adler's place that's for sure. 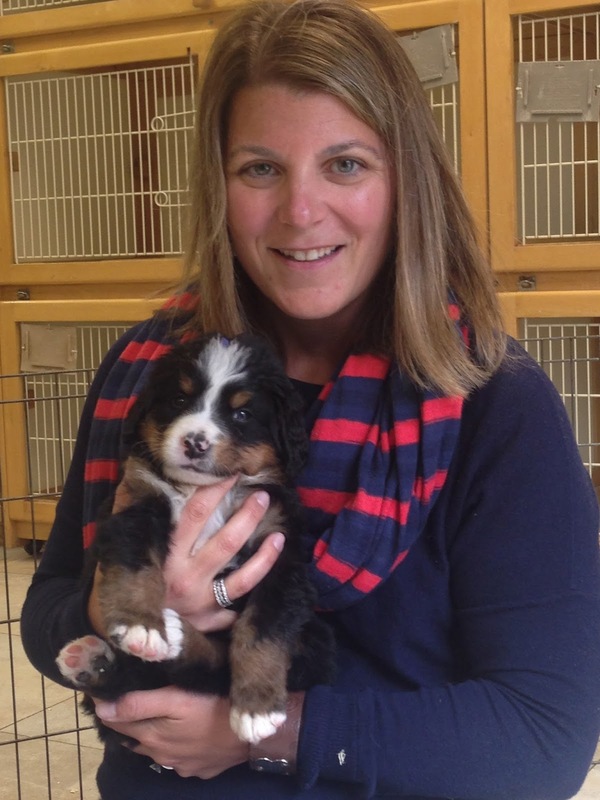 But having another Berner to love is a tribute to her and how wonderful she was." Yes, that's exactly how I felt at that moment and still do. 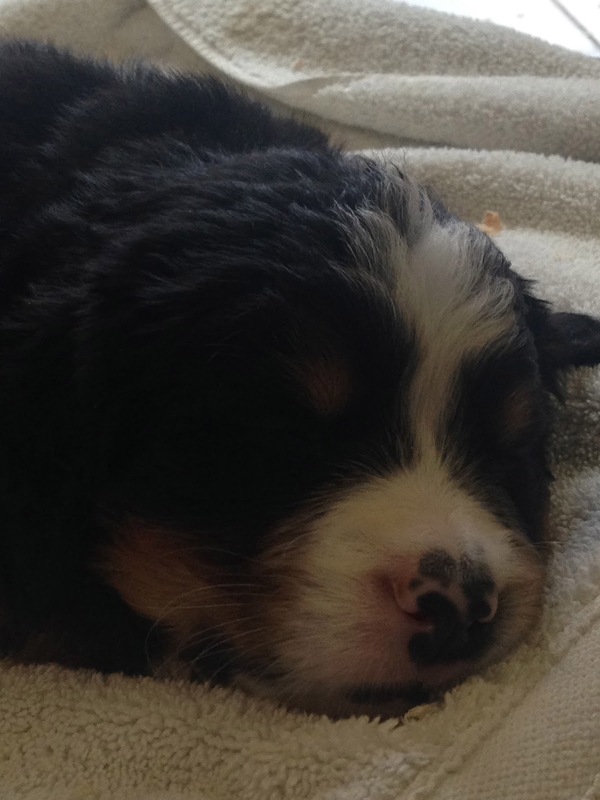 Thus, we began the process of bringing home another Bernese Mountain Dog. She was born on Feb. 28, 2016, in a litter of 12 puppies which is huge litter for the breed. (Adler was from a litter of six and that was big.) This is the biggest litter our breeder has had in their more than 30 years of raising Bernese Mountain Dogs. So last week we made the trek out to our breeder's place to pick out our new pup. They were all adorable so how do you pick? We didn't have the opportunity to pick Adler but now we had this opportunity. 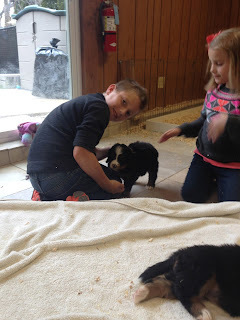 The kids loved seeing all the puppies and I think it made it that much more real to them that we were getting another dog. Adler was the pink puppy (as they used nail polish on their fur to tell them apart) and this time we chose the purple one. I had asked Adler to give us some type of sign to let us know which one she thought would be a great addition to our family. The "purple" pup was the one that picked us from the moment we walked in and then climbed up on me and ever so gently kissed my chin. Thank you Adler. So next Saturday, we will once again be parents to three kids and a dog. I ordered her food and bought new toys. When they arrived, Austen and Peyton were very excited. We told Hailey these new things were for our new puppy. "No," she said, "they are for Addie!" She was adamant and mad that we kept insisting they were not for Adler and that Adler does not live here anymore that she lives in the stars and moon. Finally, we gave up. Hopefully she figures it out next week when the puppy comes home but I can see how this can be super confusing for a 2.5 year old! Anyway, we believe there's no better way to honor our Addie girl. She will always be a part of us and live on through our new Berner girl. We're officially Spring Breakers now. Us, who used to be the people that would vacation at off season times and therefore enjoy less crowded locales and great rental rates. Gone are those days now that we have two in public school. Now, we take vacations with the rest of the masses...unless you hit up a locale like the Cayman Islands! Seriously, probably one of the easiest vacations that I've been on with the kids. Yes, they are getting older but an uncrowded international terminal at the airport on Easter morning coupled with a quick direct 4 hour flight and a 20 minute ride to our accommodations ensured that we were on the beach by 2pm, and all were happy. 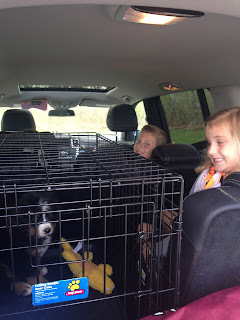 This year, we lugged no car seat, no pack and play, no diapers or makeshift high chair. The only semblance of babyhood we brought was a stroller and that was mostly because we didn't rent a car and we walked to a lot of places. 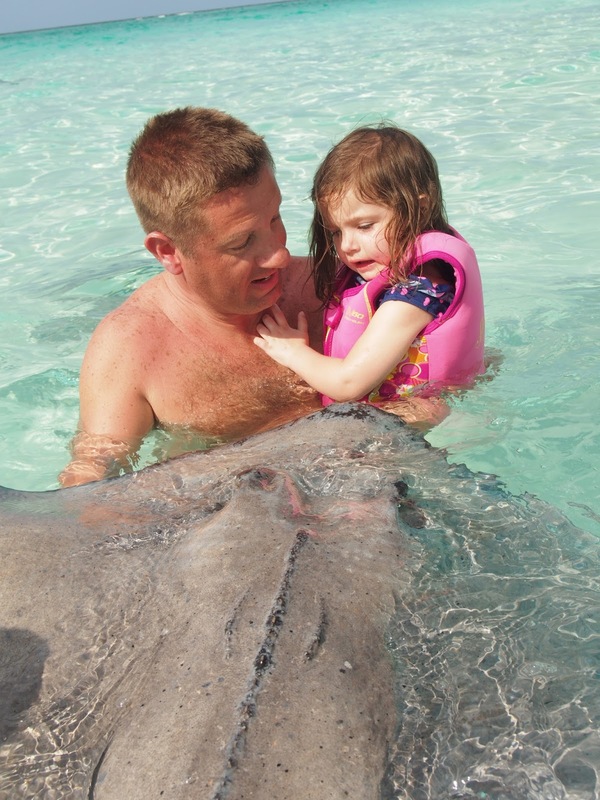 So what can I say about Grand Cayman. Beautiful. Great weather although we did have a bit of rain one day but it wasn't enough to get the kids out of the ocean or the pool. The water was the kind of blue you don't see unless you travel to the Caribbean. The condo we rented was amazing. It had enough room to keep us all happy that we weren't on top of each other and a beautiful screened in balcony as well as an outdoor one. We ate many a meals (grocery store was right across the street) staring out at the ocean. Why go out when you have the best view right there? We did leave our condo though to sample the local seafood fare, visit the turtle farm, swim with the stingrays and snorkel. It was Austen's first time snorkeling so he was a bit hesitant but with a little encouragement he dove right in! Great vacation. Great Island. Great Memories. Can't wait to go back. 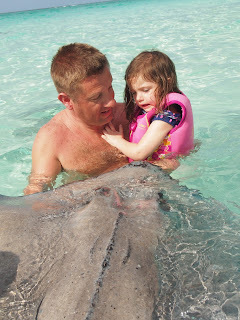 Stingray City Sandbar - Hailey's not so sure about this animal! Hold it like a pizza box, they said. Crystal clear...instead of walking, we went swimming down the beach. This is the view from our balcony...every day. Amazing. Dinner out with a low of 79 every night. We never needed coats! How can life get much better than this? Our Easter post is about a week late, but better late than never as we just got back from a week in the Caribbean (but more on that in next week's post). I realized a few months ago that our flights out for Spring Break 2016 actually fell on Easter Sunday and Easter morning to be exact. So that foiled all of the Easter egg hunt plans especially the infamous Easter egg hunt at Grandma's house. Austen was none too happy about that since Grandma gives some pretty cool prizes to those finishing first and second. We made the best of it anyway and held our Easter egg hunts a day early, and luckily Grandma planned an extra Easter egg hunt for the kids so they didn't feel like they missed out at all. Look out for that stick ready to poke you in the eye! And, she loved finding her Easter basket. The other two, a bit older, still had fun hunting for their eggs...and their baskets. But my favorite photo has to be of my Dad with Austen. He tried to hold Austen back from the finish line so Peyton would come in second but Austen wasn't having any of that. It was bad enough he didn't get first place this year. The hunt was over but the memories will remain. Thanks Grandma for making sure they didn't miss out this year!